The Challenge: The Ticonderoga Historical Society, a much revered upstate institution organized in the late 19th Century, was in need of an online presence update to help it demonstrate its continued relevance in the early 21st Century, and to help it to “Perpetuate American Traditions for Future Generations”. It had a static website that really did not do justice to the scope and work of the Society. The Solution: After discussing the organization’s needs and focus, we first developed a handsome, functional WordPress website using a premium theme from Elegant Themes. The site is easy to navigate, quick to load, and highlights, through a dynamic slider and other elements, key features of the organization and the museum it operates. Some design elements, such as font and background texture hint at a historical times. The site permits visitors to get engaged as a volunteer or member, and to join the organization’s email list. We added additional sections and a calendar using Google Calendar that permit the organization to keep the public up to date about events and exhibits. We also created social media accounts (including Twitter and Google+), and integrated new and existing social media accounts with the site and vice versa. Visitors to the old site will automatically and seamlessly get redirected to the new site. 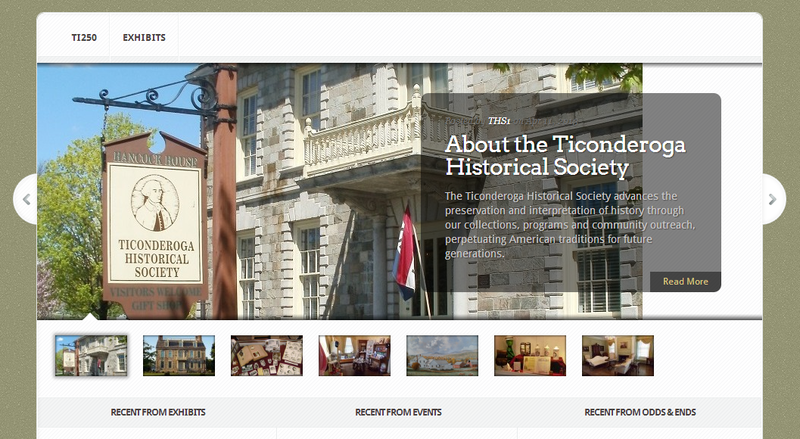 We also created a subsite within the principal site in anticipation of the 250th anniversary of Ticonderoga in 2014. Ticonderoga, the First 250 Years Committee, is co-sponsored by the Ticonderoga Historical Society and the Ticonderoga Heritage Museum. It was formed to lead the Community in commemorating three historic anniversaries: 250 Years- Settlement of Ticonderoga (1764-2014); 150 Years- Civil War (1861-1865); and 200 Years- Lake Champlain Battle of Plattsburgh 1814 (War of 1812). The subsite is a separate WordPress installation that uses the same theme, though with different design elements, such as color, that allow visitors to feel continuity while appreciating the subsite’s distinct focus. The site responds well to screens of all sizes (it is “responsive”) so is ready for visitors on tablets and smartphones (an ever increasing portion of the online community). It is imbued with on-page search engine optimization characteristics (but not over optimized!) to ensure search engines find and index the site appropriately. In addition to social media, we helped THS to create a free email newsletter account through Mailchimp so THS can regularly reach out to its constituency. THS opted to host with GoatCloud as well, and to make use of our managed care services. In that way, THS is ensured that the site is always up to date, backed up, secure, and functioning smoothly. We are providing WordPress training to THS as part of the package as well. One of the benefits of WordPress is its intuitiveness and ease-of-use even for people who are not exceptionally tech savvy. The Ticonderoga Historical Society is a great institution. Visit the website, but if you are in upstate New York, you should make it a point to visit in person, too!